Wanna join the Discord server? Here’s a link! That’s why they’re coming out of her body and are pink. He can… but he also wants a life. Now she has a voice in her head outside her own thoughts, this should be fun. 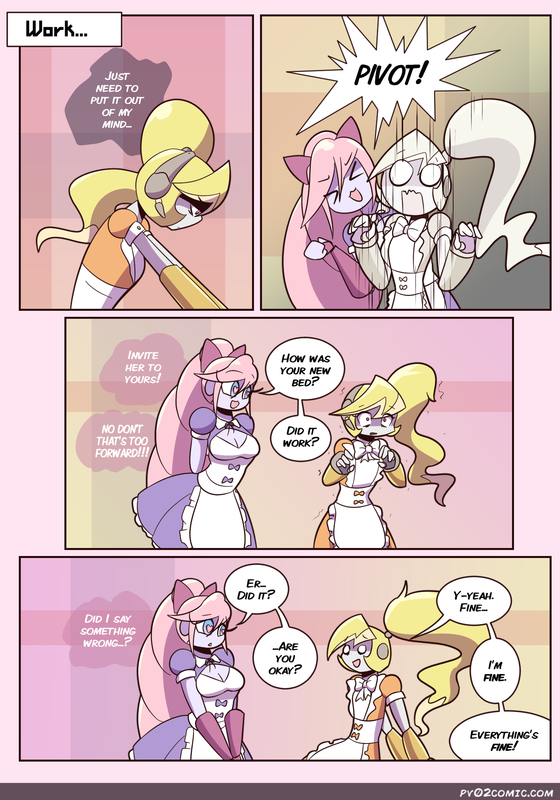 Socket: …I don’t believe you. Socket: You don’t sound fine to me! Are you hiding something? Pivot: What? No! I’m not hiding anything! Socket: Pivot, you’re really making me worry! Socket: Please! Tell me what’s wrong! Pivot: I…It’s just…I had a bad dream, okay? But it’s okay. I’m still fine! Peachy! Socket: Omigosh! Was it because of the bed I gave you? Was it really that bad? Do you hate me now? Pivot: No, I don’t! I like you! Collet: *gasp* *whispering* Is that what they call a lover’s quarrel? I read about this in some eastern Asian comic book! It’s from a…a…M-mongo? Mango? Alison: It’s called a manga. And what the hell are you doing, Collet? Aren’t you supposed to be at the counter? I honestly think this would sell as a graphic novel. You don’t have to do that, but i would buy a physical copy of this for $10-20 CN if i saw it at chapters. Love the look on Pivot’s face in the second panel. Too bad it comes at her expense, but hey, a little jumpscare makes sure you’re alive. Well that’s interesting. Looks like your receiver got a boost. Maybe that program is doing more than just restoring memories. Also don’t be rude and try to not get distracted buy it. Everything’s fine, the revelations are coming more consistently and answering less questions than they create. To fear is to become Prey.